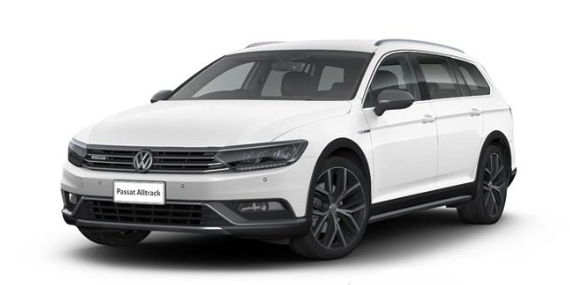 The Passat Alltrack combines wagon comfort with SUV versatility to spirit it’s occupants down a country lane, outback track or a city highway. Chrome and silver highlights that include matte chrome mirror shells, dual chrome exhaust trim, aluminium look side sill extensions, chrome trim strips on the side windows lend a touch of attraction. All around the cabin are hints that this is a Passat designed to take on the rough stuff. Alltrack lettering on the door sill inlays and centre console lid are an elegant reminder of the vehicle’s capabilities, while aluminium-finish foot pedals and appealing ‘Titanium’ and ‘Tracks’ trim on the dashboard and doors add a touch of exclusivity. Front Assist uses a radar sensor integrated in the front of the car to monitor traffic ahead. In critical situations, the system alerts the driver through visual and audible warnings. If no response is detected from the driver the brakes are automatically applied to avoid or reduce the severity of an accident. City Emergency Braking is an extension of the Front Assist system and – at speeds of up to 65 km/h – it monitors the area in front of the Passat Alltrack. The 4MOTION all-wheel drive system has been further enhanced in the Passat Alltrack. When operating under a relatively low load or when coasting, power is primarily distributed to the front axle, and this basic drive layout saves fuel. However, the rear axle can be variably engaged in fractions of a second whenever necessary, even before any wheel starts to slip, and this eliminates nearly all loss of traction.